Since the publication of the first edition of Environmental Impact Assessment in 2003, both the practice and theory of impact assessment have changed substantially. Not only has the field been subject to a great deal of new regulations and guidelines, it has also evolved tremendously, with a greater emphasis on strategic environmental, sustainability, and human health impact assessments. Moreover, there is a greater call for impact assessments from a global perspective. 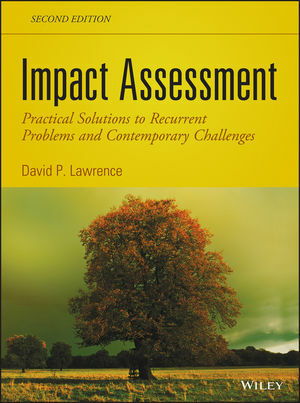 This Second Edition, now titled Impact Assessment to reflect its broader scope and the breadth of these many changes, offers students and practitioners a current guide to today's impact assessment practice. Each chapter first addresses the topic with current theory and then demonstrates how that theory is applied, presenting requirements, guidelines, and best practices. Summaries at the end of each chapter provide a handy tool for structuring the design and evaluation of impact assessment processes and documents. Readers will find analyses and new case studies that address such issues as multi-jurisdictional impact assessment, climate change, cumulative effects assessment, follow-up, capacity building, interpreting significance, and the siting of major industrial and waste facilities. Reflecting current theory and standards of practice, Impact Assessment is appropriate for both students and practitioners in the field, enabling them to confidently respond to a myriad of new challenges in the field. DAVID P. LAWRENCE, PhD, is an Impact Assessment Specialist with more than thirty-five years of experience in study design, impact analysis, alternatives evaluation, social impact assessment, cumulative effects assessment, and sustainability. He has undertaken numerous applied impact assessment research studies, published extensively, and taught at both the undergraduate and graduate levels.